ADORED VINTAGE: Interview with vintage inspired jewelry designer "FRESHY FIG"
Interview with vintage inspired jewelry designer "FRESHY FIG"
Upon our first sighting of the vintage brooches turned modern day pendant necklaces, we were instantly smitten with "FRESHY FIG", a vintage inspired jewelry line on Etsy. 1.] Tell us something about yourself and what you do? My name is Amanda and I have my jewelry business in Portland, Oregon. My boyfriend and I work together in our cute little vintage apartment. - Bonjour Amanda! So excited to have found you and your jewelry line FRESHY FIG on Etsy! 2.] What are 3 things inspiring you right now? Three things that are inspiring right now are the layering of clothes and jewelry simultaneously, mixing metals, the idea of extracting modern looks from vintage pieces, and lockets...oh wait, that was four. - It's hard for us to limit to just 3 things too! So excited to see where your inspirations take your jewelry line! 3.] What's the best part about what you do? The best part of what I do is having the opportunity to constantly collect and re-work already beautiful vintage pieces and then resist the urge to keep them all for myself! - We totally have this problem with wanting to keep all of our vintage finds too! 4.] Do you have any new creations in the works? If so, what can we expect from you soon? I always have new creations in the works! I try to get at least 10 new items up on the site per week. 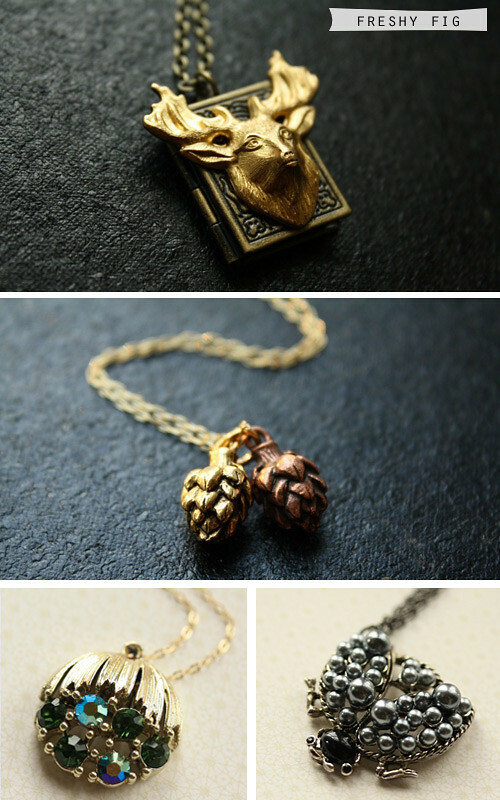 You can expect owls, leaves and new image lockets galore! - We're so excited for the owls, love owls! 5.] When was the last time you had a really good laugh? Having a creative job keeps the goofy juices flowing daily...and working across the table from my cheesy boyfriend helps too. - YAY, we love cheesy spouses too! And cheesy friends! I'm wondering when owls became such a big hit! Love them though! What about birdcages :O Would those be stocked soon enough? Love the jewelry above! :) Great Post.